Abstract: Stuffing you whole computer into a pocket so MP3's can travel along just isn't practical. 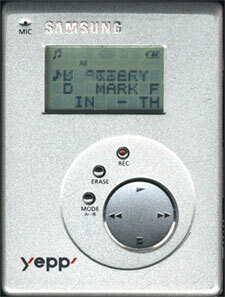 Enter the portable MP3 player, and our review of the swanky Yepp. MP3's have surpassed adult content as the No.1 search entered into search engines. With the massive media attention surrounding recent RIAA lawsuites against Napster and MP3.com to the multi-million dollar deal struct with Limp Bizket you get the feeling that MP3's are well... unstopable. With that in mind I thought I would pick myself up one from the handful of new portable MP3 players that have been hitting stores. As a bonus, you get to see how it performed ;-) The Diamond Rio and Creative Nomad seamed to be the logical choice, but after looking around a bit more I found the Yepp, and picked it up. The Yepp stood out because it was just so small, had a sleek aluminmun cover and well... just caught me eye! Voice Recording ADPCM format / Up to 125 tracks / 128 min. Phone directory Stores up to 350 records with name, home and office phone number fields. I couldn't find anything on Samsung's site about the 64MB flash memory card but I have been told it does exists (e-mail me if you know where to get one). Anyway, one of the things I looked at when trying to decide which player to get was size. As I discovered, the Yepp is the smallest of the three, and also the lightest.